Using confiscated mail as a starting point, Dead Letters: Censorship and subversion in New Zealand 1914-1920 reveals the remarkable stories of people caught in the web of wartime surveillance. In 1918, from deep within the West Coast bush, a miner on the run from the military wrote a letter to his sweetheart. Two months later he was in jail. Like millions of others, his letter had been steamed open by a team of censors shrouded in secrecy. Using their confiscated mail as a starting point, Dead Letters: Censorship and subversion in New Zealand 1914-1920 reveals the remarkable stories of people caught in the web of wartime surveillance. Among them were a feisty German-born socialist, a Norwegian watersider, an affectionate Irish nationalist, a love-struck miner, an aspiring Maxim Gorky, a cross-dressing doctor, a nameless rural labourer, an avid letter writer with a hatred of war, and two mystical dairy farmers with a poetic bent. Military censorship within New Zealand meant that their letters were stopped, confiscated and filed away, sealed and unread for over 100 years. Until now. Intimate and engaging, this dramatic narrative weaves together the personal and political, bringing to light the reality of wartime censorship. 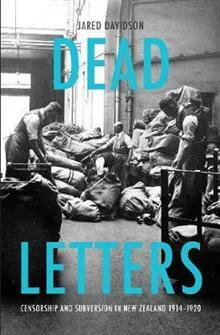 In an age of growing state power, new forms of surveillance and control, and fragility of the right to privacy and freedom of opinion, Dead Letters is a startling reminder that we have been here before. An archivist by day and labour historian by night, Jared Davidson is an award-winning writer based in Wellington, New Zealand. He is the author of Remains to Be Seen and Sewing Freedom, a curator of the exhibition He Tohu, and an active committee member of the Labour History Project. Through social biography and history from below, Jared explores the lives of people often overlooked by traditional histories - from working-class radicals of the early twentieth century to prison convicts of the nineteenth.